In the late 80's, Taito produced a Superman arcade game. Last Friday's post depicted a female character who appeared in some unused sprites from said game--people speculate that she was intended to be a Player 2 sprite. 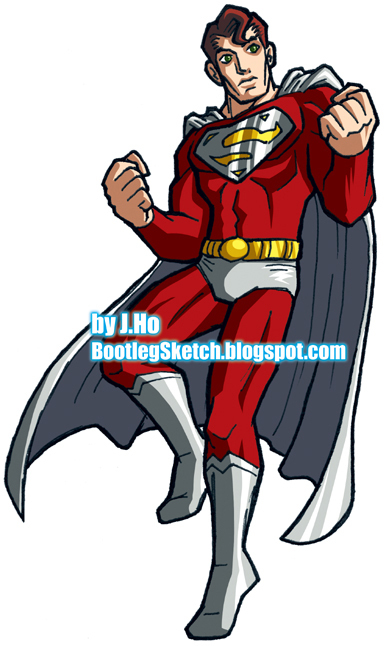 The actual Player 2 sprite in the game was a red and grey palette swap of Superman. This piece and the previous one were both drawn rather small, probably because they were done somewhat spontaneously. I interpreted the Player 2 Superman's grey and yellow colors as silver and gold--in my opinion this clashed a little less. I was somewhat at a loss when it came to rendering the hairstyle of the unused Wonder Woman-esque character, but I finally settled on a somewhat anachronistic feathered Farrah Fawcett-esque style. Who are these characters? Do they hail from an alternate reality known as Earth-Taito? Or perhaps they're modified clones created from the DNA of Superman and Wonder Woman? Maybe they're descendents of the heroes we know so well? I've mentioned it on this blog before, but it bears repeating--I really love obscure characters. Obscure + mysterious is a bonus. I also have a fascination for bootleg toys (hence the blog URL), and these two characters have such a charming bootleggy/knock-offish quality about them, I can just imagine discovering cheap action figures of them in Chinatown.